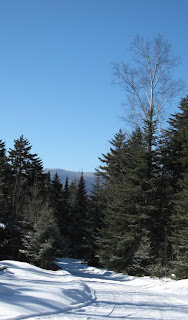 Today's featured photo is the view of the Adirondack High Peaks Street and Nye from the homestead. I live in a pretty nice neighborhood. It is Adirondack blue and thirty-two; clearly a day that requires outdoor activities. Check back later for a ski report!